The initial introduction between a rescue dog or puppy to a household with an existing dog (or dogs) is so important yet is often overlooked, with the new addition being taken straight into the home to meet its new housemate(s). Everyone tends to assume all of the dogs involved will just sort themselves out. However, the reality is that the newcomer has a) just been taken away from everything familiar, b) experienced a journey of variable length, c) met new people, d) encountered an unfamiliar environment – and on top of that is expected to deal with meeting the resident dog(s) too. Some dogs will also not be too happy about the apparently random intrusion of their home by a completely unfamiliar individual. So how can we ensure that these initial introductions run as smoothly and stress-free as possible for all involved? After all, first impressions count. Every situation will differ in terms of how much time there is available for a smooth introductory process. For example, some people will be able to visit the new addition on several occasions before bringing them home at a time convenient to them, whereas others will have to deal with the new dog or puppy arriving from abroad in the middle of the night. Ideally, start with some scent transfers. If there’s the opportunity to meet the new woofer before you bring them home, take along a cloth that you have stroked all over your existing dog(s) (one cloth per dog), focusing particularly around the face. Allow the prospective pup to have a good smell of the cloth(s) (feed them treats if you like, after they have had a good sniff so they start to form a positive association with the scent). Then, repeat the procedure with the new pup – stroke them with a NEW cloth (don’t wipe the scent of one dog onto another dog, because they can’t choose to avoid it. For a species that navigates their world through scent it can’t be pleasant to have a strange, potentially unpleasant scent wiped all over them…). Take the cloth home with you and let your original pooches have a good sniff (associate with treats if you remember). Set up the home with barriers such as baby gates or pens/room dividers with plenty of time to get the existing dog(s) used to the new layout before the new dog arrives. This will become invaluable as a management tool (see below). When the new addition is brought to the house, give them an opportunity to explore first without the presence of the other dog(s). If you can pop the other dog(s) in the car or ask someone to take them out for a walk, you can give the new pupper a chance to find their feet in their new living environment. Namely, they will want to determine where the exit points are (leave the back door and any other external doors open where possible, if they lead to safe contained areas), where the water is and to generally familiarise themselves with the scent profile and setup of their new home. Initial physical introductions should ideally be conducted on neutral territory i.e. go for a walk together. If this isn’t possible, then the garden will do. There is generally more space in the garden than the house. Space is your friend if any dog is slightly unsure. Before you let the dogs into the garden or home together, pick up all resources that a dog may guard such as food bowls, chews, toys and even beds if necessary. Provide several water bowls in different locations. The dogs should be introduced when arousal levels are low. Don’t have visitors around at this time (or indeed for a day or two). If the new arrival is particularly overwhelmed and fearful, they may just choose to find a hiding place. In this instance, allow them this choice and provide them with everything they need in that area. 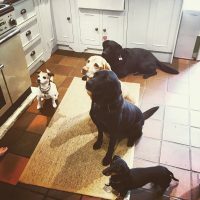 Every dog will differ in terms of the appeal of another dog – it may help improve the confidence, or may be something else for the new dog to deal with at a time when they are already overwhelmed. To prevent any risk of tension around resources, separate the dogs before providing access to anything one might value enough to guard (e.g. at feeding times, before giving chews, or before providing toys). This is particularly important if you know that your existing dog(s) have any guarding issues towards other dogs, but also whilst you get to know your new dog. The use of babygates or pens means the dogs can be in visual contact and you can observe body language for any signs of unease about being in the presence of another dog whilst they are in possession of something they value. Diffuse any signs of tension by encouraging one dog to move away (giving them each more space) and aim to do this positively – it can be a common human reaction to reprimand any dog who shows any signs of hostility towards another dog. However, this means that the “grumpy dog” will associate the presence of the other dog with being reprimanded – thereby further entrenching their negative emotional response to the other dog. ‘Bothering’ can also be a common issue, particularly when introducing a puppy or younger dog to a home with an older dog. The young dog may be overly persistent in their request for interaction from the older dog, and appear to ‘not read’ signals that the other dog doesn’t want to play or when they are being told off. In this instance, management is going to be essential to give the older dog plenty of breaks away from the ‘botherer’ and to prevent the pest from rehearsing getting in the other dog’s grill. Separation where the dogs are each given their own independently reinforcing activities (such as chews, stuffed Kongs, activity feeders, things to shred) and the ‘nuisance’ dog being kept on a lead when in the same room together, encouraging and reinforcing relaxation (for example, using a pre-taught settle on a bed) is a good place to start. Watch out for flash points such as bottlenecks (typically doorways and owner interactions) where dogs are brought closer together than they may otherwise choose, are often also accompanied with arousal. For example, external doors are associated with people arriving to the house and going for walks. This can sometimes lead to redirection onto the other dog. If this may be the case, be proactive about separating dogs beforehand, or reinforcing one for staying on a bed whilst interacting with the other. We are often worried about fairness once we own more than one dog. However, every dog has different needs and will require individual time to fulfil these needs. What we should be concerned about is consistency with each individual. For example, elderly dogs, puppies, new dogs, and different breeds of dog all have different requirements. Some might be allowed access to certain rooms or upstairs, where others aren’t. Some may have access to certain furniture or dogs beds where others aren’t. Each has a different exercise requirement. Get rid of the guilt, focus on keeping things stable for your dogs and you should have the recipe for a happy household!